Sunday night we boondocked at the Cody, Wyoming, Wal*Mart. We spunt $150 on food and bear spray. The former should last us at least a week, and the latter, one would hope would last a lifetime. 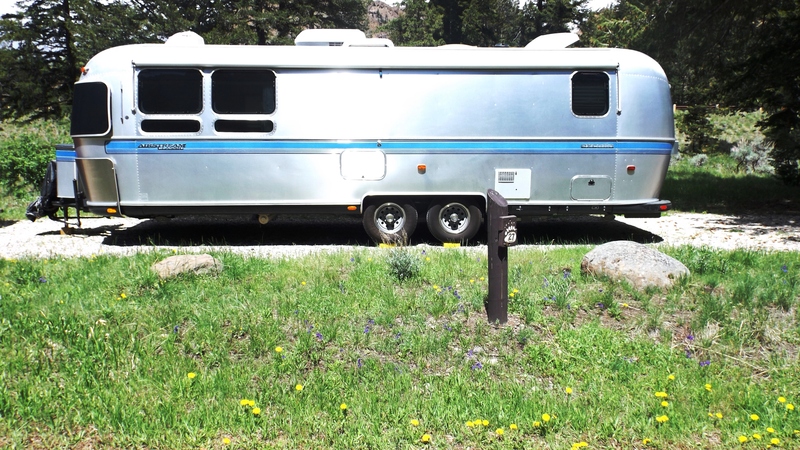 It was a nice 40 mile pull to Newton Creek campground just outside the East Gate of Yellowstone Park. This is better than a primitive site, but far short of a full hookup. It has a hand-cranked water spigot, nicely graveled campsites, fire-rings, tables, and an incredibly beautiful setting. The Shoshone River runs right next to the campground, and Newton Creek splits the camp into east and west sides. It’s a spring-fed creek, perfectly clear and cold, rocky with a steep angle into the river, and quite shallow. It’s also a spawning creek for a few cutthroat trout. Spawn season peaks over maybe ten days, and depending on the weather, those days fall between May 15 and June 15. We never saw the first fish, but later learned that their camouflage on the topside makes them very difficult to spot, even in water as shallow as this. As it turned out, we were there for the peak of the spawn. The Shoshone has cut a canyon perhaps 500 feet deep over several hundred million years. 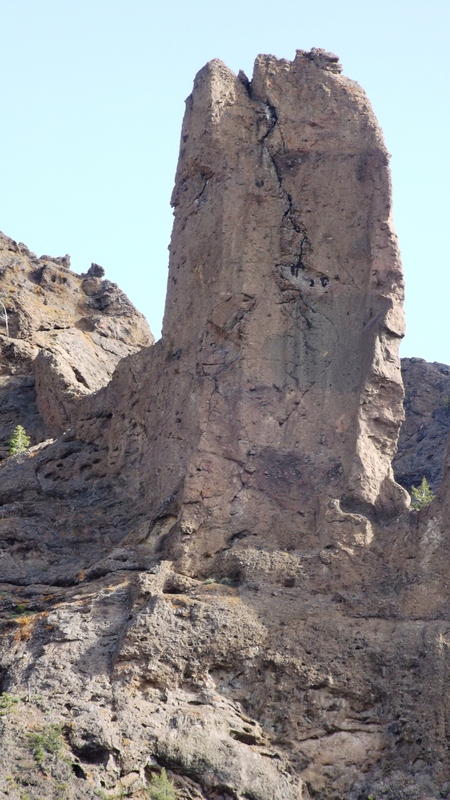 Unlike the soft soils of the Badlands, much of the rock remaining is pretty hard and has taken on interesting shapes. Below is one I call “Man with Migraine”. Look closely: you can see eyes, nose, ears, chin, and a cleft running from the top of his skull almost to ear level. There are the Twin Towers. The cliffs are pocked with caves and in testament to the persistence of life, trees, shrubs, and grasses do pretty well on those nearly vertical walls. 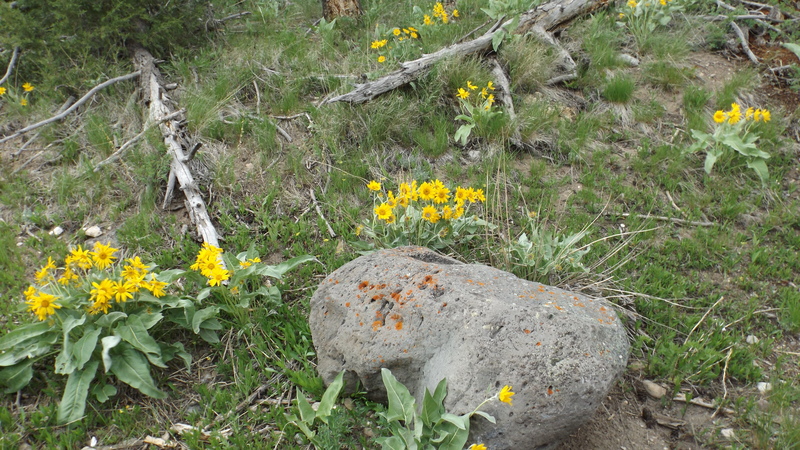 Our campsite welcomed us with those yellow flowers that grow like weeds from Louisiana at least to northern Wyoming and some little wild violets. On the other side of the highway we found something resembling black-eyed Susans with golden eyes. The trees were mostly lodge pole pines – think of a sailboat mast with a tuft of pine-needled boughs at the top. This by far is the prettiest campsite we’ve seen. Thanks for the fun read! We spent a year in Wyoming and I miss the beauty. Wish I was camping there now…. Thanks for reading us, Sheri. I think it’s a fun write! Wyoming is wonderful but it is just possible that I’m more impressed with Idaho. Of course all that irrigation they do has something to do with that, but it is another wonderful place. We’re gonna try to get up to Glacier in the next week or so; that should be lovely as well. Thanks for letting us know you’ve read … it always makes our day.